A friend of mine sent me a picture of her new DIY birdbath and I was instantly in love. I tweaked her design a little and waa-la now we have our own birdbath. This project is really easy and if you're like me it won't cost you a dime. 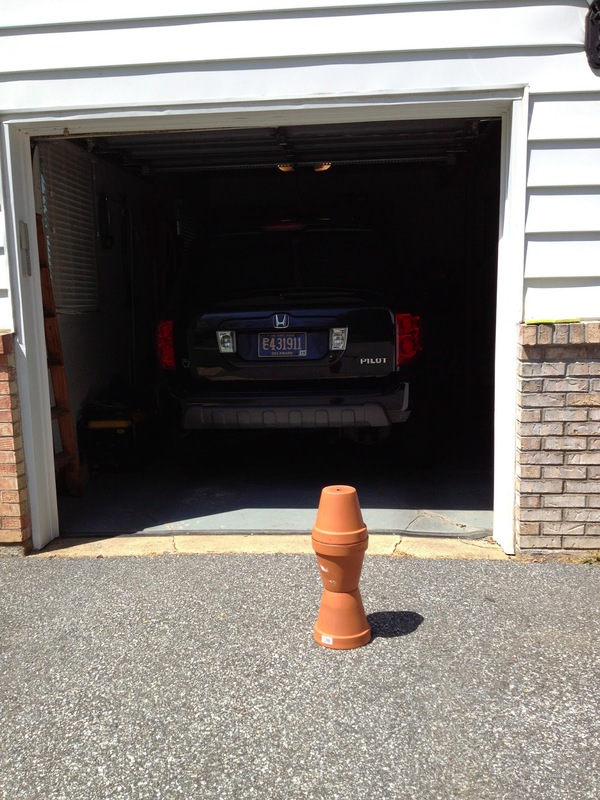 I dug around the garage and found three large terracotta pots. Since mine were all the same size I stacked them one on top of each other with the two bottoms glued together and then two tops together. If you have various sizes, you can stack them all facing the same direction in a tier with the largest pot on the bottom. However, depending on the size of your pots you may need more than just three. I used epoxy to glue all the pots together. Note to self: Don't glue your pots in the driveway in front of the garage where you'll soon need to more your car. Once they were all glued together, I used more epoxy gorilla glue to attach a plastic planter saucer on top for the "bath." I was planning to use a terracotta saucer, but my mom had this plastic version in her shed and she gladly handed it over. Cha-ching. After my birdbath was firmly together, I spray painted it with a textured spray paint. This time, not in the way of my car. I still can't get over that it took me two cans of this spray paint to cover the thing. I think it's a combination of the fact that the textured spray paint doesn't go nearly far as the untextured and that the pots just soak it up. It covers pretty well, but the cans seemed to empty really fast. And I do have one confession to make - I didn't spray the inside of the saucer because I wasn't sure if it was "bird" friendly....plus I didn't want to run out of paint halfway through and need a third can. Now it's sitting pretty in my yard ready for my two year old to splash in the birds to enjoy a bath. As always, thanks for stopping flying by 2IY. If you like what you see, we'd love a pin, a "like" or a shout from a nearby rooftop. Great idea! I notice in the picture that it looks like you added a shepherd's hook to your birdbath. How did you do that? Now that I look at the picture, it does look like the shepard's hook is on the birdbath. It's actually not, it's just in the ground right behind it. That would be a great idea though!